We hit the road out of Regina just after 8 am for Drumheller, Alberta with half a tank of fuel, figuring we’d see a Husky station in Moose Jaw on Hwy 1. Surprisingly, we did not and I didn’t want to go downtown so we continued west as some of the smaller stations are just too small to get into and often do not sell diesel. Anyway, we did find a Husky, right on the highway, in the small town of Caronport, just a few miles out of Moose Jaw. Chris did the mandatory coffee run while I manned the pump. She came out with two steaming cups of coffee and two awesome cinnamon buns! Another long day on cruise control watching the country roll by. The above shot isn’t snow. It is salt! 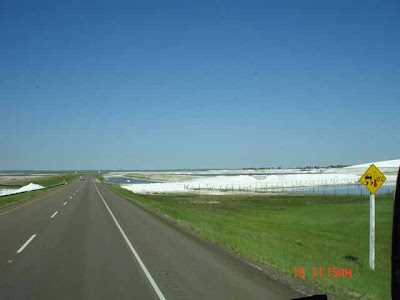 Salt lakes we saw near Swift Current, Saskatchewan. The rolling hills were just beautiful to see. We both thought it odd that we hadn’t see any more buffalo. We saw some on the way into Regina near Indian Head the other day but none since. 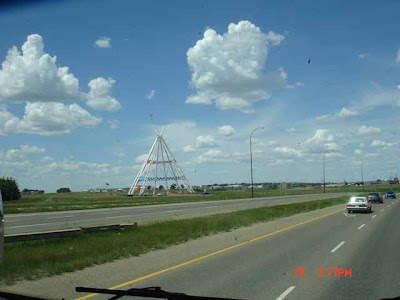 Take about endless horizons and the old joke of being able to see your dog running away for three days….. We crossed into Alberta and rolled through Medicine Hat to see the world’s largest teepee. 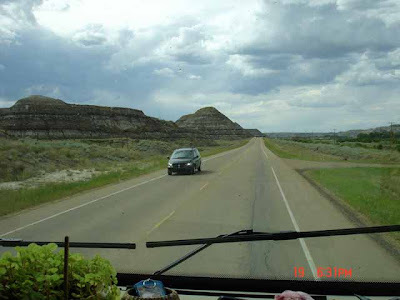 About an hour west of Medicine Hat, we turned north on Hwy 56 to Drumheller. You can see the hoodoos in the picture below. This is dinosaur country and home of the Royal Tyrell Museum. 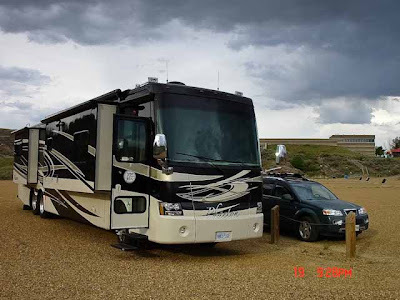 We rolled into Drumheller just after 5 pm and parked our motorhome at Walmart. I unhooked the car and we nipped over to the museum to see what was in store for us tomorrow morning. The museum has a huge RV/bus parking and the staff was kind enough to let us overnight there. So back to Walmart, grab the motorhome, stop for fuel at a local Husky in Drumheller and then on to the museum. You can see us parked in their lot, just us and the dinosaurs. 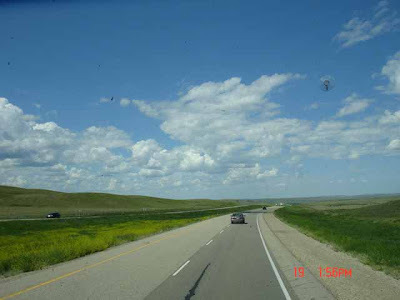 This entry was posted in Alberta, Saskatchewan.